The effect of heavy rainfall is evident at a corn field north of Greenville Thursday. Many local fields remain flooded, threatening crops. 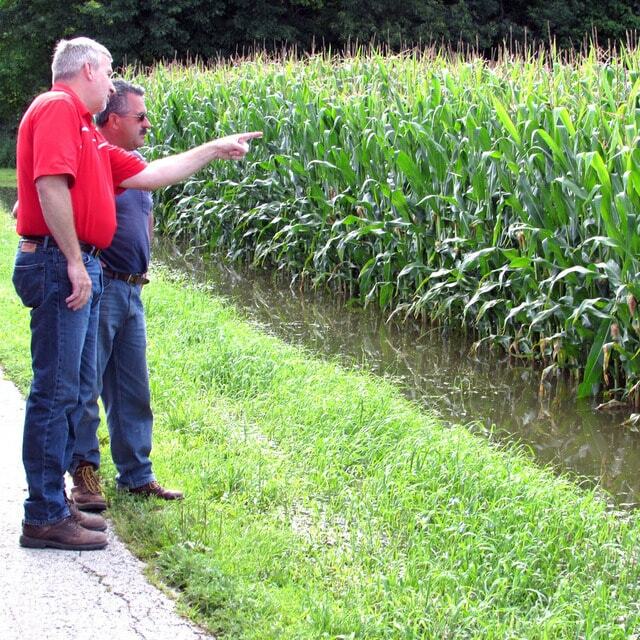 Sam Custer (left) and Scott Labig examine Labig’s corn crop following recent heavy rainfalls in Darke County. DARKE COUNTY — Excessively heavy rains that have fallen in Western Ohio over the spring and summer continue to pose a threat to corn, soybeans and wheat in the region. Darke County farmers caught no break late Monday and early Tuesday as a thunderstorm dropped large amounts of rain on the area. During the 24-hour period, northern portions of the county saw heavier precipitation, with rainfall in excess of five inches. Parts further south experienced one to three inches of rain. Sam Custer, educator with the Darke County Extension of the Ohio State University, was on the road Thursday, examining local fields to investigate the effect of the rains on crops. One of Custer’s stops was at the farm of Scott Labig, north of Greenville. Labig, who grows corn, soybeans and wheat, said that while his corn still appears to be in good condition, he’s lost some of his soybean crop. “Of the 300 acres of soybeans, I’m estimating I’ve lost about 15 acres due to water damage,” he said. Labig’s 286 acres of corn appears to be mostly unaffected, though parts of one field are submerged. He remarked that even with the corn looking good, disease pressure appears to be very high. Gray Leaf Spot and Northern Corn Leaf Blight are fungal diseases that thrive in wet, humid conditions. For farmers who didn’t harvest their wheat, however, time appears to have run out. “Wheat that has not been harvested is quickly deteriorating either by disease or because it is sprouting in the heads in the fields,” Custer said. Regionally, areas north of Dayton, such as Darke County, appear to have taken the hardest precipitation hit. Unofficial estimates provided by the National Weather Service (NWS) report that for the greater Dayton region, June’s rainfall was the fourth highest on record — 7.88 inches. Thus far, July appears to be on track to set further records. Custer said that the area has seen unusually high rainfall since April. “From April 1 to this week, we’re seeing rain reports as high as 25 inches in some areas, down to 16 inches in others,” he said. Labig remains hopeful for his remaining crops, but said the effects of the rains will likely be felt by both farmers and consumers. “Consumers will definitely feel the price on bread because of the wheat crop. I think we will see higher grain prices on everything from here on out,” he said.